Everything is bigger in Texas, right? Even our thirst. Houston has become known for all its amazing craft breweries. We have come a long way since 1994 when Saint Arnold Brewing Company launched. A few years later No Label Brewing Company, then Buffalo Bayou Brewery, 8th Wonder Brewery & Karbach opened. Now it seems we have a beer entrepreneur expansion almost as big as our thirst. We offer a ton of different tours to not only the Breweries in Houston & the surrounding areas, but also the distilleries and wineries. Every 3rd Saturday of the month we offer our Get Crafty (beer) Houston which is very unique tour taking you to 3 of Houston’s local craft breweries but also one of Houston’s hidden secrets, The Beer Can House. Yep, a house made completely out of beer cans right in the middle of a neighborhood. This is a “DO NOT MISS” tour in Houston. All our tours include transportation, tour guide, entry fees, tours at each location, 2-4 tastings at each location, souvenir glasses from each location, and truly amazing swag bags. Your tour guide & driver are paid but trust us, you will want to tip them once you see how AMAZING they make the experience. Thank you for Catching the #BreweryWave. Please make sure you follow us on Instagram/Twitter @thehoustonwave & link your fun pictures to us. 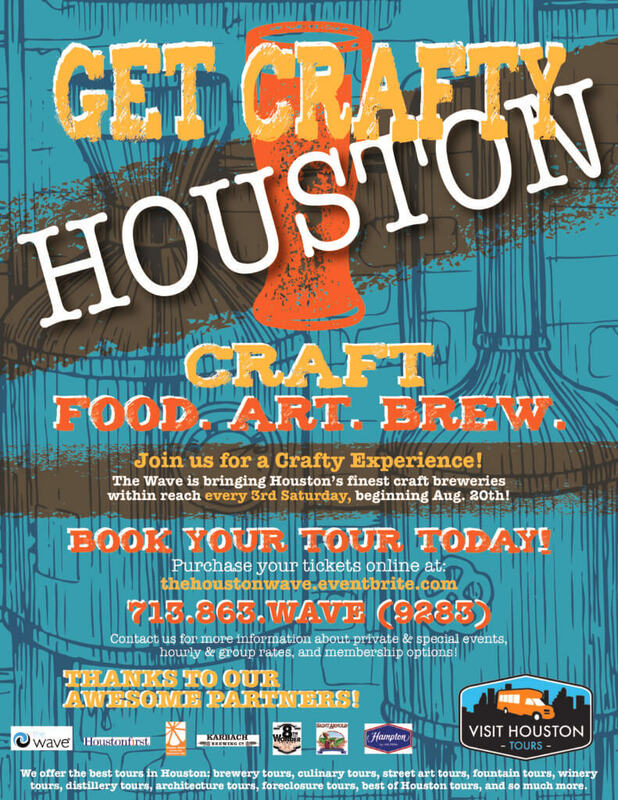 Use #BreweryWave, #ridingorange, #houstontours, #visithoustontours and #visithouston. Please see below more detailed instructions to make it the best experience possible. What is included in the brewery tour price? All of our tours include transportation, tour guide, entry fees, tours at each location, 2-4 tastings at each location, souvenir glasses from each location, and truly amazing swag bags. Your tour guide & driver are paid but trust us, you will want to tip them once you see how AMAZING they make the experience. Refunds will not be given within 48 hours of event. Once everyone who signed up is there or we have talked to them. How long are we at each spot? Usually around 45 minutes at each. We will have a tour guide there with you in a bright Wave shirt. Make sure you communicate with them & find them at the time they say we will start heading out to the bus. Yes, however we do not recommend drinking in between each brewery. You will be given plenty of beer during your tour. We do not provide it, but you may bring it. We ask that you not bring glass. May I eat on the bus? Yes. Please dispose of your trash when departing the Wave & we do prefer you do not bring glass on board. At least a couple stops will have food options if you want to purchase additional food. You might want to bring a light, collapsible chair to sit outside some of the breweries as they have limited seating. Most breweries will have either food trucks or a kitchen available if you would like to purchase food. Bring a small bag so you can safely store all your souvenir goodies. Bring snacks if you like for the bus rides in between. Bring your drinking shoes & smile b/c this is a blast!!!! Note: Closed toe shoes are required on some of the brewery tours. Are there special rates for seniors or children? All participants on the tour must be at least 21 years of age. Do I have to purchase tickets in advance? Can I pay in cash? Please remember to follow us to find out about our new tour calendars that will be posted soon. We have some incredibly exciting new food/beverage tours coming online next month!